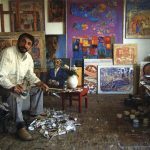 Boris Yeghiazaryan – Kyivite…Armenian….contemporary…timeless….avant-garde…traditional…an artist. Any one of these words would serve as a good starting point to consider his work. However, it is much more interesting to combine all these things to form a picture of one man and his creativity. In fact, when you know about the path that Boris’ education and creativity have taken him along, this fantastic melange does not seem so surprising at all. It begins in Yerevan, at the Terlemezyan College of Creative Art, followed by The “Muhinka” in St Petersburg. In 1986 Boris returns to Yerevan to study at the Institute of Theatre Art and, finally, at the Academy of Art in Kyiv, from which he graduates. It was this terribly long odyssey which eventually took Boris to his Ithaca, the borderless land of fine art. 25 years ago, nobody, not even his closest relatives, could say what made the boy from the Mountain village of Aparan, want to study such odd subjects as drawing and painting. Everything around him in his childhood: the nature of the mountains, Aragatz – the most wonderful mountain of all, with its cold springs, peacefulness and thrilling expanses –nature and life cried out to him, “paint, paint, paint”, and he obeyed. Most certainly the artist in Boris Yeghiazaryan appeared during his childhood, in his homeland. There is no doubt about it he is an Armenian. His works contain everything that is quintessentially Armenian, especially the colour. Oh that Armenian colour – the expression, the wonder, the brightness of life! But Boris Yeghiazaryan is not an Armenian artist. He is a Ukrainian-Armenian, a Kyivite from Yerevan and there is no way of getting away from it. Kyiv has become his second creative home. In his bright stormy works, the velvet tones, the soft shadows and the fine transparent layering are Ukraine. His creations are pure, bright and joyful, encompassing his Armenian roots and embracing his adopted country. And then as any artist that belongs to his public, Boris has as many fine admirers and friends in Kyiv as he has in Yerevan. They live in his Armenian head and in his portraits. And there are many portraits, all extremely beautiful: There are probably hundreds of others hanging on walls all over the world… The fact is that friends appear wherever he goes with his festive paintings and exhibitions: in Greece, Switzerland, France, America and Canada. An art critic once said that Boris was a teller of fairy tales and that his works are joyful fairy stories. I do not agree. After all, he has not spent all his life in a studio staring at canvases. There have been many difficult and painful times. There was the Karabakh Campaign, in which Boris took an active part, and even war! Once, the KGB came to his home when his wife was nursing their baby daughter, and then there was the worst nightmare for all artists: a fire in his studio, where he lost 10 years of work. Through all of these experiences, he found his way to God. Boris does not paint stuff of fairy tales. He paints life! Through expert painting and collage techniques, he achieves a rich narrative quality in his works, the colours are luminescent, the figures quite simple. Boris Yeghiazaryan’s creative works include frescoes, sculpture, mural paintings, stained glass, sculpture, prints, collage and poetry. But it is his passionately spirited and engaging oil and watercolour paintings that constitute the literal and figurative heart of his work.